I will give them a shout, and hopefully there is a proper LOS from my house. Why don’t you try Sa Wireless, been around for 12 Years in Alberton. Was wondering who you decided to go with? 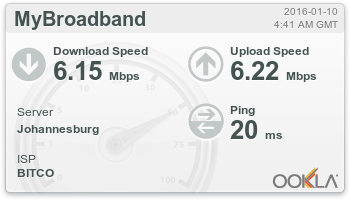 Also looking at wireless in the Alberton area as ADSL infrastructure is not great here. It was between Amobia and EasyWeb but after reading the reviews for Amobia, I am now looking at EasyWeb or SkyFi. SkyFi is much cheaper in both their packages as well as installation costs. Yes, was at my friends house in Alberton last night, took my Xbox with to do a bunch of downloads, they have a 10Mbps connection. Took about 10-20 minutes to download a 7GB Game. It was a bit misty last night, the speeds dropped to about 6-8Mbps. Ping was around 20-50MS. Sorry, didn't take screenshots of tests Only one from the first of January when I was there. I Have decided to go with them, but my upload speed doesn't seem to be near that screenshot. How long did sky-fi take to respond to you and get the tests organised etc? Tbh, they were quick with everything. I spoke to them on Friday, Tuesday a LOS survey was done (there was LOS) then on Thursday it was up and installed in my duplex. Took about 1h40 for the installation but they did a very neat job and also ran the cable through the roof to make it less of an eyesore. Don't suppose you know your distance and elevation? Anyways I have decided to sign up with easyweb in meyersdal Alberton. It's a bit pricey. 899 for A 5meg. R999 for installation after successful line of site test. 1 year contract. They came to do the test at my place yesterday in the rain. They tried really hard, got on the roof etc while raining. But they couldn't install the dish because of the rain so they will come back next week. The guys were really good. Hat off to them for getting wet etc. So far service is good. Will post again after the installation and initial testing then again after the 3rd month or so... Been looking for a wisp in meyersdal for about 6 months. also decided to go with them because they are also based in meyersdal so hopefully if I need support it will be quick. What was wrong with skyfi? I won't get into that again.. Last thread was deleted by the mods cause it got ugly. Just I used to know them personally and I wouldn't deal with them. That's all I'll say. Some people might have a good experience with them so if they can offer u the service u want then go for it. I have been using D&D Networks. They are a part of D&D Tactical in the South of JHB. I'm using their 2mbps connection. It's quite pricey at R725 including lightning insurance. 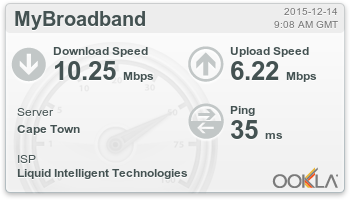 Their service is ok, but their speeds drop every 2 or 3 days, to around 20-50k download. I send their technical person a WhatsApp message asking for the speeds to be fixed, and usually within half an hour or so, things speed up, but downloads very seldom go as fast as I hope or expect. Their support guy once mentioned a contention ratio of 1:25, so that might have something to do with it? I live in Brackenhurst, close to the Checkers center just off Swartkoppies. D&D have told me that there is a lot of interference on the wireless spectrum in my area, and that's why the speeds are erratic, but I'm not convinced about that. SkyFi looks good to me, but the installation fee of R3500 puts me off in a very very big way. SA Wireless looks a lot better. Their 2meg connection at R300 incl. VAT is WAY cheeper than what I'm paying right now, but I can't find any recent reliable feedback on their quality of service and support. Can anyone here provide some? SkyFi has been somewhat disappointing experience so far, appointment to check line of sight was missed. After losing my cool they sent someone out immediately. Couldn't confirm line of sight and promised to come back the next day to test with equipment and nothing happened. Going to see if easyweb is any better now. Just some info SkyFi and Easyweb are using the same network. Same ground network or same towers? I don't mind whatever network there is in the background, just looking for someone that can actually get me connected at home.